When the rain comes be prepared with our one time use emergency rain poncho. It’s small enough to keep in a purse, glove box, first aid kit or sports bag. Who Doesn’t Love a 50% OFF DEAL? 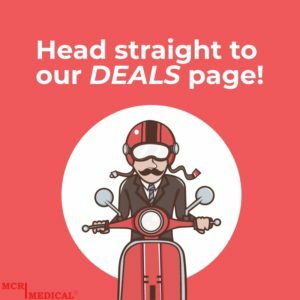 Head to our Deals page on MCRMedical.com! It’s time for us to make room for new products here at MCR Medical. Soooo… we have decided to offer a great deal on our Grab-N-Go Warm Hand Warmers. Right now all hand warmers are 50% off. Yes that’s right, half off! Use promo code STOCKUP at checkout. What a perfect time to stock up for cold weather. The hand warmers don’t expire until 10/2020 so you could purchase enough for the next 2 winters! For all the details on this popular item check out our blog post titled : Grab-N-Go Warm Hand Warmers ‘Shake Up’ the Industry! With the support of all of our great customers we are bursting at the seams in our warehouse. This means we need to move out some products to add more great items such as our Grab-N-Go Dry Emergency Rain Ponchos, Prestan Manikins and more! Continue reading Who Doesn’t Love a 50% OFF DEAL? Posted on April 12, 2018 April 12, 2018 Author MCR MedicalCategories Emergency Supplies, MCR Medical, Other ProductsTags #emergencyrainponchos, #emergencysupplies, #handwarmers, #mcrmedicalLeave a comment on Who Doesn’t Love a 50% OFF DEAL?